THE NUN is the latest film from the Conjuring Universe, and it was directed by Corin Hardy and stars Demian Bichir and Taissa Farmiga as a priest and a soon-to-be nun that are sent by the Vatican to investigate the death of a young nun in Romania, where they encounter the demonic nun that was introduced in THE CONJURING 2. THE NUN fails to live up to the best work of the Conjuring universe (The Conjuring, The Conjuring 2, Annabelle: Creation) because it focuses too much time creating the lore for the demon nun instead of creating a well-written story that is engaging to watch. 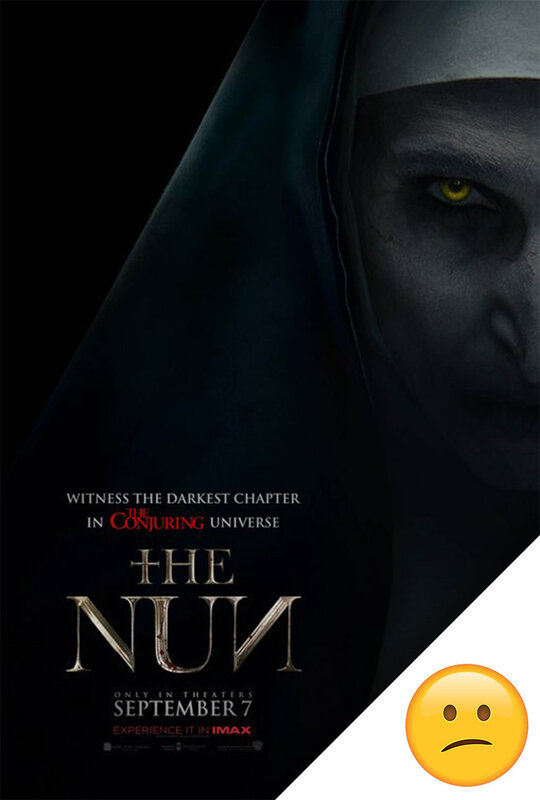 I will say I enjoy the background story given to the nun; the nun is my favorite character from the Conjuring universe, so I enjoyed learning the backstory to the demonic figure, but the film puts the cinematic universe over the character building in this movie, and it did suffer because of it. While their characters were not written well enough to create much sympathy for them, I did mostly enjoy the work that Bichir and Farmiga brought to this film; they are doing good work with a subpar script. I also will give director Corin Hardy his props for doing some good camera work around the castle in Romania that created some visually fun scenes and shots. It’s almost impossible to live up to James Wan’s masterful horror direction, but Hardy did a decent job here while working with a lackluster script. The first act of the film was very slow and boring before it picks up in the second act. The side character Frenchie, played by Jonas Bloquet, was mostly annoying and did not add anything to the story; I rolled my eyes each time he showed up in the second half of the film. The scary moments were mildy thrilling, but no where near the scares created in the Conjuring films. I will commend the team for not relying on fake jump scares. Jump scares are heavily present and are hit and miss in the film, but they are placed with the moments that are actually supposed to scare you, which I appreciate in this era of rinse and repeat horror tropes. THE NUN added some fun background to the Conjuring Universe, but it failed to create a memorable story. It is in the middle of the pack of the horror year: it is miles ahead of the jump scare montages in TRUTH OR DARE or WINCHESTER, but it lacks the character and story work in A QUIET PLACE and HEREDITARY. The end result is a forgettable film that was made to add a background to a demon nun and make millions at the box office. In the latest installment of the Mission: Impossible franchise, Christopher McQuarrie delivers one of the best action films in years. Tom Cruise outdoes his last effort as Ethan Hunt, as he delivers amazing stunt work that leads to top of the line chase sequences (both foot and vehicle), fight scenes, and breathtaking stunts. Mission: Impossible is my favorite action franchise of this century, and I believe the series continues to improve by using practical effects to create intense action that kept me glued to the screen throughout. I can’t praise McQuarrie’s vision for shooting action enough; he delivers beautiful Steadicam shots that focuses on the great fight choreography. A particular fight scene in a bathroom is one of my favorite action sequences in years, due to the wide shots and brutal punch effects that the score provides. Henry Cavill is a great addition to the M:I universe, and Simon Pegg is a joy once again as the great sidekick Benji. The classic score of the Mission Impossible franchise is back and great once again, and I'd be remiss if I didn't mention the beautiful cinematography throughout the different European film locations. Despite a few action scenes that are a tad unbelievable, this movie blew me away and is certainly one of my favorite films of the year. Tom Cruise, please play Ethan Hunt for as long as your legs will allow.